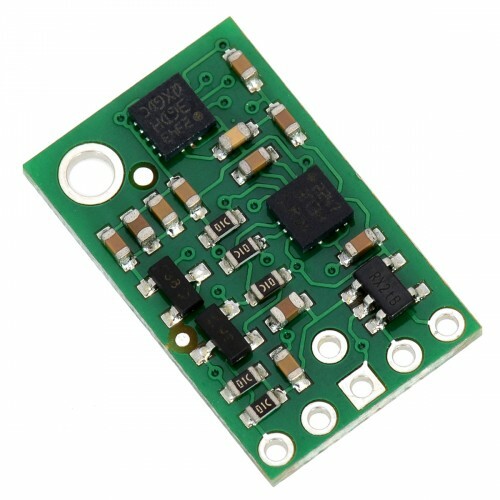 The Pololu MinIMU-9 v3 is a compact (0.8″ × 0.5″) board that combines ST’s L3GD20H 3-axis gyroscope and LSM303D 3-axis accelerometer and 3-axis magnetometer to form an inertial measurement unit (IMU); we therefore recommend careful reading of the L3GD20H datasheet(3MB pdf) and LSM303D datasheet (1MB pdf) before using this product. These sensors are great ICs, but their small packages make them difficult for the typical student or hobbyist to use. They also operate at voltages below 3.6 V, which can make interfacing difficult for microcontrollers operating at 5 V. The MinIMU-9 v3 addresses these issues by incorporating additional electronics, including a voltage regulator and a level-shifting circuit, while keeping the overall size as compact as possible. The board ships fully populated with its SMD components, including the L3GD20H and LSM303D, as shown in the product picture. Compared to the previous MinIMU-9 v2, the v3 version offers a number of improvements arising from the use of newer MEMS sensors, including a wider maximum magnetic sensing range and better gyroscopic accuracy and stability. This version also adds a pin for changing the sensor slave addresses, allowing two MinIMUs to be on the same I²C bus. The MinIMU-9 v3 is pin-compatible with the MinIMU-9 v2, but changes in I²C addresses and configuration registers might require some changes to software written for older versions (this should not be an issue if you are using our Arduino libraries). The MinIMU-9 v3 is pin-compatible with the AltIMU-10 v4, which offers the same functionality augmented by a digital barometer that can be used to obtain pressure and altitude measurements. The AltIMU includes a second mounting hole and is 0.2″ longer than the MinIMU. Any code written for the MinIMU-9 v3 should also work with the AltIMU-10 v4. The above schematic shows the additional components the carrier board incorporates to make the L3GD20H and LSM303D easier to use, including the voltage regulator that allows the board to be powered from a single 2.5 V to 5.5 V supply and the level-shifter circuit that allows for I²C communication at the same logic voltage level as VIN. This schematic is also available as a downloadable pdf:MinIMU-9 v3 schematic (190k pdf). The L3GD20H’s gyro and the LSM303D’s accelerometer and magnetometer can be queried and configured through the I²C bus. Each of the three sensors acts as a slave device on the same I²C bus (i.e. their clock and data lines are tied together to ease communication). Additionally, level shifters on the I²C clock (SCL) and data lines (SDA) enable I²C communication with microcontrollers operating at the same voltage as VIN (2.5 V to 5.5 V). A detailed explanation of the protocols used by each device can be found in the L3GD20H datasheet (3MB pdf) and the LSM303D datasheet (1MB pdf). More detailed information about I²C in general can be found in NXP’s I²C-bus specification (371k pdf).